The Gaiscioch Family regrets to inform the community that Findan.2439 has ascended to the great beyond. He lost his life after several years of battling organ failure after a tragic car accident that left him in a coma for several months back in Nov 2014. After he woke he spent the better part of a year in a hospital and finally was able to come home. Since then he was readmitted to the hospital several times and on February 12th 2018 he passed. It is with a heavy heart that we report the loss of this highly influential member of our community who lead over 240 public events for the players of Guild Wars 2 in his time commanding. These ranged from PvE to WvW events and always welcomed everyone to participate. Here is the article we wrote to remember him. 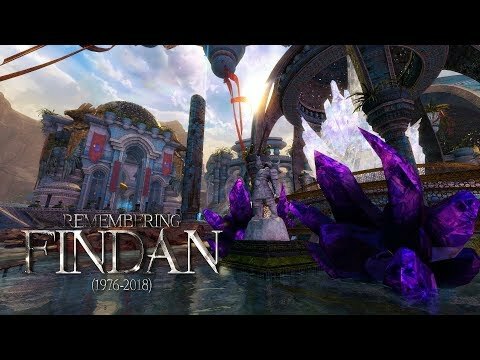 I know Findan connected with a whole lot of the Guild Wars 2 community and we wanted to include you all in his memorial. I am very sorry to learn that Findan passed away. He was a very nice player, and I know he impacted so many others. My thoughts are with his guild and his family. Sorry for your community's loss. Also to his friends and family. I am very sorry about this loss...my condolences to his family, friends, and the GSCH family. I was privileged to have participated in many GSCH events in the past, and I adore these people for their energy and commitment in keeping their wonderful community together, as well as helping all players participate in the game. For these people to lose a member, it is like losing a part of the family. Always keep alive the memories of those that have passed...and this way they will never be truly gone. Sorry for your loss. This is the kind of person that makes mmos fun. Although I never participated in any of the activities I know for sure those activities are increadibly fun to be part of and makes mmos so much richer. Hope you guys will keep doing the stufferino! aw man sorry to hear about this, RIP man. Great thing is, no more suffering, only an endless journey of spiritual ascension, salutes to this deity! rest in peace my dear friend. i will miss you very much. Thank you all for the kind words. He will be greatly missed. In honor of him Gaiscioch is going purple (his favorite color) for the remainder of February. Sorry for your loss, and it's sad to see someone go away. I would love to join in but I'm unsure if I'm working or home at my ex to visit my kid. But I hope it will be a great memorial! I knew of Findan quite well, and was so excited to see him return after his accident. I know he didn't keep up the cadence on events like he used to, but knowing he was out of that coma was amazing and an answer to prayer back then. AS much as it saddens me to see this new news, I am happy to know that he was able to share his life with his family and friends for at least a good few more years. I miss him already; when I was on SoR, he was someone I interacted with quite often. One thing about Findan, is you weren't just a person in his party or squad; you were a person. Period. He interacted with you on a genuine, empathetic level, and I loved this about him. You are surely missed, but never forgotten, brother! The first time I went into wvw, it was people yelling non-stop, and it really stressed me out. Then a friend suggested I try running with Findan. Wow, he was so awesome. He was about teaching us and trying to make us better players vs. about winning a single match. We would get slaughtered and he would very calmly say, "good job, let's re-spawn". I learned so much about seize, builds, playing as a team, and most importantly, how a great commander leads. He was calm, smart, funny and a genuinely nice person. I am sincerely upset by this news. It is interesting how someone you will never meet in person does have an impact on your life, and their loss is felt, literally, around the world. Wishing you peace on your new journey, Findan. Good Hunting. So sorry for your loss, wherever he landed may Findan be gaming with the best of them and .. with no lag what so ever, epic loot and every critical landed perfectly. R.I.P. So sorry for your loss. Great memorial, nothing will bring this great man back, but he will not completely leave this world. He will be remembered by many. So from me and those around me, our sympathy goes out to you all. He will be missed. My deepest condolences to Findan's family and friends. Findan, you will be missed. May your legacy live in the hearts of all of us who had the privilege to share the game arena with you. Farewell, Findan! We'll meet again on the other side of the rainbow. Heaven has been given a perfect angel in every way ! Findan will always be in my heart, he has given me his friendship and love. There are so many words to describe this beautiful perfect man, he is all that is good in this world and in heaven! I will miss his conversation, his voice, which I still hear every day saying " Hello Darcy " . He was the first person to talk to my toddler granddaughter in comms , she would listen to him and smile, sometimes you didn't understand her words but Findan cared enough to give her his time! There are truly not enough words to describe the heartache of losing this wonderful person. To his Father, Sister, and Brother-in- law , we spoke of you often , he always had wonderful things to say about you. Tricia , you brought him love, joy , and peace ! Thank you for being there for him! There is a plan for all things that God does, we will not know this one till we meet Findan in Heaven! I love you dearly and will miss you my wonderful ,caring, amazing adopted brother of mine! Please have a jumping puzzle ready for me when I join you in Heaven , you will need a portal because I still will not be able to jump! Posted the article and memorial video. Thank you all for commenting and leaving your feedback. His family has been reading your posts and is amazed by the reach their son had. My heart is heavy at hearing of the passing of "Findan". Although I only knew him through playing online his kindness and sense of humor had shone through. I have missed following him around in WVW because he always made it fun win or lose. I was new to GSCH and he was very welcoming to both me and my son. I can only imagine the sadness and loss his family is going through and my heart and prayers are with them. I am grateful to have met him. God bless "Findan" and his family. So so sorry to hear about this. May he rest in peace and his next journey be a great one. I stumbled upon this post because I was looking for a way to honor my Dad's memory in-game. It was one of the only ways I could get to spend time with him because we lived so far away. I wish there were a way to put a tombstone in our home instance or something of that nature so we could pay respects to our loved ones in-game.